Red Buck Pipe Tobacco is a special unique brand made with the finest tobacco grown in the world, the Kentucky Burley Leaf. 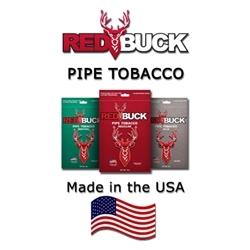 Produced by Tanus Tobacco in Kentucky, Red Buck has quickly developed a reputation as the go to tobacco brand across the smoking world. This high quality tobacco is blended together so perfect, the burn stays even throughout every smoke, providing a distinctive smooth taste that possesses a flawless balance of aromatic and flavor. Pipe smokers who love using an excellent premium tobacco like Red Buck, due its ability to stay lit easily offering an all-day smooth and mellow taste, with pleasant aromatic room notes. A solid value as a pipe smoker’s best friend. Try one of our most trusted pipe tobacco brands offered here at a very low online discount price. Switching to Red Buck Pipe Tobacco for your everyday smokes is a great alternative to expensive and over-priced retail brands. Here at Smokers Discounts we’ve made it easy and affordable to buy pipe tobacco online. Call us for more details!